Today's image was scanned some years ago from a photograph in my father's collection. Even then the subject was unidentified, but my inattention to the photograph's size and type, the scan trimmed to exclude all but the image itself, and a complete lack of any notes whatsoever, is a good lesson, I suppose, in how not to do such jobs. It may be a commercially produced postcard, but it could just as easily be a print using a privately owned camera. I should have scanned both front and reverse in full colour at the highest resolution that my scanner could handle, including the full extent of the photographic print and mount. It would also have made good sense to record its dimensions, a note on the type of photograph, and any inscriptions and notations written or stamped on the back. However, given that I don't have any of this information, and inspired by intelliwench's recent vehicular theme (1, 2, 3), I wondered if I could ferret out a little more about the photograph, and make a stab at who the subject might be. The man wearing a coat and flat cap and sitting at the wheel of the car is not, as far as I can tell, an immediate member of my Payne family, that is to say, one of my ancestors. Nor is the building outside which the vehicle is parked a Payne locale that is familiar to me. However, he could well be a sibling or cousin (or husband of) one of my ancestors. To progress any further I need a date for the photograph. The format is unknown, but to see if I could find out the size I opened up the original scanned image in Adobe Photoshop (v5.5) and with the marquee option outlined it. Then with the Options window open, I set the Preferences/Units & Rulers to show centimetres. This gave horizontal and vertical dimensions of 127.6 x 74.8 mm (or 5" x 3"). By the way, this technique only seems to work if the image has not been modified (resized) from the original scan. It is too small, I think, for it to have been a postcard photo (6" x 4"), even allowing for a margin, and it seems more likely that it was an ordinary print from a roll film used by an amateur. Now to the photograph itself. A date would be most helpful but I'm not very good at dating mens' clothing from between the wars, which is my broad guess at the period, and I'm even more hopeless with vehicles. A browse through the Help Pages of the Surrey Vintage Vehicle Society (SVVS) threw up some pointers, such as this 1922 Rover 8, two-seater. Although somewhat smaller, the style is very similar, which at least gives an approximate date of manufacture for our vehicle. I've sent off a detailed scan to the administrator of the SVVS site, in the hope that one of their members can identify the make, model and year, and will report here if and when I get a response. In the mean time, I have been wondering if the building in the background is some sort of garage. It has an unusual glazed roof extending out from the building, and adjacent to one of the supporting poles is a tall, narrow, wooden box-like structure; it has occurred to me that the latter might be a housing for a petrol pump. Alternatively, it has been suggested that the building might be a country house, with substantial outbuildings and covered area for car, coach, etc., and that the boxed structure might be the housing for a hand-operated water pump. On further reflection, I think the latter to be far more likely. I'd be grateful for any thoughts on this one. I still have very little idea of who it might be. I suspect that he would be somehow connected to my Payne family from Derby, but the photo could have been taken anywhere. Unfortunately the number plate is not visible, as that might have provided a location. Thanks to the keen eyes of a reader, I feel that we now have a probable make for this vehicle. Andre points out that the Singer models appear to be the only ones that characteristically had four lug bolts per wheel, rather than the three shown on the Rover above. This fully restored 1926 Singer 10/26 model, shown above and below, is listed for sale on a Classic Cars web site. The rounded rear protruberance of the car, housing what was referred to as a dickey seat, made accessible by folding a flap back, is identical to that in my photograph. According to Rick Jones' Old Classic Car web site and numerous others, the Singer 10/26 roadster was produced in both two- and four-seater versions from c. 1925 until 1927. They include an example, shown above, in which the make is "emblazoned on the two gallon petrol can, affixed to the offside running board, behind the spare wheel." In addition, a large initial "S" is clearly visible in relief on the centre cap on the spare wheel. Unfortunately, as shown in the enlarged images above, the centre cap appears to be missing from the car in my photograph - in fact, there appears to be only one nut left holding the spare wheel in place. The enlargement of the petrol can is not clear enough to show a logo, if there is one, and I suspect that it is a replacement. I also note that the Singer emblem or marque on the front of the bonnet (see image above) appears to have been snapped off. The vehicle in my photograph is clearly not new, so this pushes the probable date of the photograph forward to the late 1920s or early 1930s. The man looks to be in his late twenties or thirties so I estimate a birth date of some time in the 1890s or early 1900s. As yet, I don't have a likely candidate from my own family, or should I say there are too many potential candidates. It is possible that he was one of my grandfather's cousins. More investigation, comparison with other photographs, and contact with relatives will be required! Many thanks to Andre Hallam and Rick Jones for contributions. Lots of things against it. The contoured bonnet and profiled rad for a start, then the headlamps being considerably lower than top of mudguard. The Singer has louvered bonnet sides while photo has them plain (no louvres) etc. The rounded body shape at the back was quite common styling feature on many makes for a few years. Disc wheels were relatively common round the turn of the 20s, and four 4 stud wheels were common too. My 1921 Citroen has four stud disc wheels. (Its not a Citroen !) If you superimpose the two cars on each other on the basis of wheel centres, you will see fundamental differences. Some photographic portraits, while technically merely average or adequate, are simply irresistible, such this carte de visite by Richard Keene junior discovered in an old album by Janet Bitton. I suppose it must have been posed to a certain extent, and it would have been difficult to keep the children still for long enough, but it has much of the exuberant feel commonly captured by street and beach photographers working several decades later with vastly superior photographic equipment. The exaggerated swagger of the two boys holding the donkey and the evident joy of the child whose turn it is for a ride, to say nothing of the donkey's inevitable reluctance to move an inch, make it unusually spontaneous for a portrait from the late 1870s. The printed design on the reverse of the card mount identifies it as having emanated from the Midland Studio of Richard Keene junior in "Derwent Street." In a previous article on Photo-Sleuth, I described how Keene opened a studio in Siddals Road, Derby in the mid-1870s, and then moved to premises in Derwent Street East in late 1876. He was fined 5s. for hanging a photographic case outside his Derwent Street shop front on 6 October 1876 [Source: Derby Mercury, 11 October 1876], providing an earliest date by which he must have moved, as well as demonstrating a street frontage to his studio, rather than being situated in one of the back yards. In June 1877, he tried to stimulate further business by offering a prize of a cabinet portrait sitting to the winner of a race of the Derby Swimming Club at the Corporation Baths [Source: Derby Mercury, 20 Jun 1877]. By January 1878, Keene was in financial trouble and, after being declared bankrupt in March, the studio and contents were sold by his creditors at the end of April [Source: Derby Mercury, 3 & 24 April 1878]. Although it is not clear exactly when he set up his next studio, but it must have been soon after the demise of his Derby business because he was certainly operating at 56 High Street, Burton by 1880. The negative number (#714) falls neatly between the #632 of a portrait taken soon after his move from Siddals Lane and the #873 on another portrait from shortly after his move to Burton-on-Trent. However, it is the writing on the door behind the subjects which reveals a clue to its location: "Private - Laboratory." This strongly suggests to me that it was the developing and printing laboratory of Keene's Derwent Street East studio, and that the portrait may therefore have been taken in the yard behind the studio. Although Keene's card mounts suggest that it was situated in Derwent Street, the 1877/1878 Registers of Electors and Burgesses, nominally dated 1 October 1877, identify Richard Keene junior as actually working from premises in Derwent Street East, which is the portion of the road extending to the north-east of the Exeter Bridge, towards Nottingham Road. Maxwell Craven, in his article on the Derby Evening Telegraph's web site Bygone Derbyshire about the history of the area originally known as Canary Island, discusses the rapid development of what became Derwent Street East in the 19th Century, particularly after the building of the more robust stone Exeter Bridge in 1852. He discusses the locations of several premises on Derwent Street East that existed at the time this photograph was taken, including the Royal Standard and White Lion public houses, established in 1862 and around 1870, respectively, and a monumental mason's workshop. I'm working on getting a much better picture of all the houses, shops and other businesses which were contemporary with Keene's studio, to enable me to pinpoint the location more precisely. However, I'm not yet at that stage, and it will no doubt form the subject of another Photo-Sleuth article in due course. For the moment, if any readers have access to any photographs of Derwent Street East taken prior to the rebuilding of the 1930s, I would appreciate your getting in touch. I am particularly interested in the north-west side of the road between Stuart and Phoenix Streets, where the Art Deco building currently occupied by NatWest Bank now stands, and the opposite side of the road, between the old Royal Standard public house and the Congregational Chapel, now demolished. I'm very grateful to Janet for finding this wonderful photograph for me, and also to Nigel Aspdin who has endured repeated requests to return to the Derby Local Studies Library for that extra snippet of information which just might enable me to find and fit the final piece of the Derwent Street jigsaw puzzle. Anon (1852) Map of the Borough of Derby with Portions of Darley, Litchurch and Little Chester, Surveyed by the Board of Ordnance for the Local Board of Health, Facsimile Edition, ed. D.V. Fowkes, publ. Derbyshire Archaeological Society, 1980. Craven, Maxwell (n.d.) Canary Island, Derby: An area rich in heritage, publ. Derby Evening Telegraph, reproduced online by Bygone Derbyshire. This postcard portrait of a young boy proudly standing next to his partially completed Meccano tower has no identifying marks showing either the subject or the photographer. The clothing is rather difficult to date, although Michael Walker kindly pointed to this BBC article which relates that short trousers became the norm for boys in the 1920s. The photograph has been taken outdoors, perhaps at the door to a corrugated iron garden shed, and the model stands on a rough wooden bench seat. The reverse has a plain divided back design, obviously not too early and possibly post-Great War, but difficult to date with any accuracy. I wondered whether the Meccano construction might provide some clues with which to date the photograph. Although I still have the set that I played with as a child, inherited from my Dutch uncle, my knowledge of the history of the toy is limited. After browsing several Meccano-related web sites, I realised that there is a huge community of Meccano enthusiasts. David Williams, a Canadian collector and "Meccanoman," who details some of the history of Meccano on his website, helpfully pointed me towards the "Spanner" Mailing List, an international group of mechanical model building enthusiasts. List member Roger Thorpe thought that the boy's efforts might have been stimulated by the iron Eiffel Tower, completed in 1889. My thoughts had wandered down a similar track, and I discovered that Meccano still produce an Eiffel Tower set, shown above. The parts are all nickel plated, as they would have been up to 1927 (and indeed you could buy them nickel plated after that by special order), so that doesn't really help us. The wood(en base) is home-made, not a Meccano part. The piece lying on the bottom appears to be an angle girder, part 8 (described here). Compare the parts 8.ni1 and 8.ni on that page (just click on the green boxes in the table at the bottom of the page). If you can see from your detailed photograph that this angle girder has rounded off corners then you can take the earliest date forwards to 1918 ... I have to say that I'm leaning towards that angle girder being round-ended, putting the photograph to at least 1918. The other thing worth checking is the length of the bolts ... from a good close-up you might be able to identify whether they are the earlier long (5/16") type or the later short (7/32") type. If they are short, this would move the photo right on to at least 1922 ... (From the images above) the bolts look to be long, making their manufacture before 1922. I'm very grateful to Michael, David, Roger and Charles for their help. It appears likely that the Meccano set from which this model was built was produced between 1918 and 1922, and I have a feeling, not unfortunately based on much solid evidence, that the portrait was taken some time after the end of the Great War or during the early to mid-1920s. ... a page from a 1913 Meccano manual, showing a model of the Eiffel Tower (shown above), which is very similar in outline to the construction made by the taciturn boy in your featured photograph. It's my guess that the boy saw this model in a 1913 (or possibly slightly later edition) Meccano Instructions Manual, and decided to use the parts he had to make a passable version. In this he succeeded as we can see in the photograph. The two postcard portraits featured in this post, which were a recent purchase, are typical of the style which became particular popular before, during and after the Great War (1914-1918). Apart from the use of the postcard format, which brought the price of studio portraits within reach of practically everyone, the pose is a complete contrast to those characteristic of a decade or two earlier. The stiff formally arranged family group, often in a symmetrical triangular, diamond, W or inverted-W pattern has been replaced by an asymmetrical distribution. However, the most striking difference in this style of portrait is that the subjects are smiling. Well, the children are; while their mother is perhaps trying, she doesn't seem to be able to put out of her mind the Victorian studio habits that she grew up with. The chintz-covered chaise longue is fairly typical of the Edwardian period between the turn of the century and the Great War. The 1910s also saw a return to the spartan studio settings not seen for several decades. Here the subject is perched on a plaster bench left over from the excesses of the 1890s, but the remaining background has been stripped to the bare essentials - a plain floor and wall, probably purposely light in colour in order to bring out the detail in the girl's clothing, which might otherwise have appeared somewhat washed out. With a child of this age, the ball that she is holding is less likely to have been used to keep her from fidgetting, but more as a simple accessory. The use of generic, mass-produced postcards enabled the studios to reduce the cost of production even further. Some of them would be stamped on the reverse with the the photographer's or studio's name, but a method used very commonly from the early 1900s until the 1930s was the blind stamp. This involved the embossing of text, an image or a logo, or a combination of these, onto the postcard without using ink or gilding. Although printed, embossed card mounts were produced by the same studios, they were able to offer these standard, stock-in-trade postcards very cheaply indeed. Edward Montague Treble was born in Hastings, Sussex in 1859, the youngest son of artist & photographer Frederick Treble and Elizabeth Wyndham. His father at various times operated from premises in Nottingham, Yeovil, Salisbury, Hastings, London, Brighton and Norwich, and his older brother Charles Frederick Treble also became a photographer, with studios in London, Norwich and Great Yarmouth. E.M. Treble possibly trained with his father before working as a photographer's manager in Yardley, Worcestershire, and appears to have moved to Derby in around 1912, when he took over the studio of C.F. Dereské in East Street. He was in business at least until the mid- to late 1920s. I've long had a fascination for old photographic portraits, and it was probably during an investigation into the life of my paternal grandfather a few years ago that this matured into what should more accurately be described as an obsession. I hardly knew my grandparents. They lived on another continent - half-way around the world - and what memories I have of them are understandably hazy. I met my grandfather only a few times in my childhood, the last occasion being a year before he died, when I was in my early teens and he was eighty-two. Although my Dad had many anecdotes about his father, he admitted to knowing very little about his early life. My aunt and cousin, who lived with Grandpa and Grandma for many years, have explained that he almost never talked about his war service years. As a result, my initial research relied heavily on linking up a framework of dated events and a sizable collection of photographs taken throughout his lifetime. I'm sure other photo-sleuths will attest to the peculiar mixture of a sense of accomplishment and gratification, that one receives from the process of trying to extract as much information as one can from a photograph, inevitably accompanied by a modicum of frustration in the knowledge that one almost certainly hasn't discovered everything there is to find. A typical example for me was the war-time photograph of my grandfather which I featured in a previous Photo-Sleuth article, "His lordship taking his rum ration." As I delve further into the background story relating to such photographs, which capture but a brief moment in the general narrative of the subject's life story, I suppose that what I'm hoping to do is build up in my mind a character portrait of the subject. Conventionally posed Victorian and Edwardian studio photographs certainly provide fewer circumstantial and peripheral clues to a subject's character than the less formal snaps which became commonplace after the turn of the century. Nevertheless, in spite of the stiff, arranged postures and the photographer's presumed instructions not to let a smile pass across their subject's lips, I believe that such a portrait can offer a valuable window into their lives, particularly when presented as part of a narrative, and with the support of other material. On a more practical note, a portrait may also be used as a convenient focusing point on which to base one's initial research of an individual in a family tree. Recently I've been trying to sort scanned images of a collection of old family portraits belonging to my aunt. Amongst these are a number which ostensibly include the three sisters of my great-grandfather Charles Vincent Payne (1868-1941). Some of the identifications were inscribed on the reverse in recent decades by my aunt and, by her own admission, may not be entirely reliable, since the last of the daughters died over forty years ago. Henry & Henrietta Christina Payne of New Normanton, Derby, who featured in a previous article, had seven children altogether, including three girls. Their eldest daughter Lucy Mary was born on 29 November 1876 at 38 St James' Road, Normanton, the house that Henry had built for them the previous year, and from which he was licensed to sell beer in September 1877. Maggie, as she was known in the family, grew up in Normanton, her mother running the grocery shop and off-license while Henry was building houses in St James' Road and nearby Crewe Street. Although I haven't had an opportunity to check the actual records, I assume that she attended St James' Road Board School in the 1880s, following her three older brothers and being followed in turn by another brother, two sisters and eventually by my grandfather - her nephew - in the late 1890s. 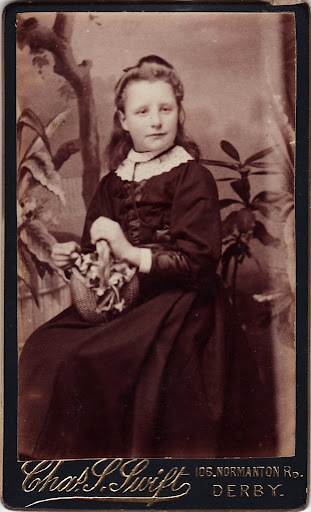 This carte de visite portrait by Charles S. Swift of 105 Normanton Road, Derby (Studio Location) was probably taken in 1890 or 1891, and shows Lucy Mary Payne when she was about fourteen years old. It's the earliest image that I have of her, although there are a further nine portraits and portrait groups (Collection: The Daughters of Henry Payne) taken at irregular intervals throughout the rest of her life. Although I can't be certain of the exact date, Charles Swift had certainly opened his Normanton Road studio by the time of the compilation of the 1891 edition of Kelly's trade directory - perhaps in late 1890 - having previously worked for his brother William E. Swift in the latter's studio at 30 St. Peter's Street, Derby. William sold his studio to R.K. Peacock and moved to Skegness some time after 1887. The rather crudely painted canvas backdrop used is the same one that can be seen in another of Swift's photographs (Image), and likewise the photographer has inadvertently included some of the rucked up right-hand edge in the photo. His later photographs showed a little more skill, a reason to suspect that the portrait of Lucy Mary was taken early on during his professional career. In the 1891 Census, shown in the enumerator's sheet above, Lucy Mary is fourteen, and it seems likely that she visited Swift's studio at around this time. Her father described himself as Vaccination Officer (a position to which he had been appointed by the Derby Board of Guardians in 1885), Rent Collector (presumably for the houses which he had been building, but perhaps on behalf of other property owners too) and "Off Beer Licence Holder." His eldest son Charles Vincent (my grandfather), by then aged 23 and working as a joiner/carriage finisher at the Midland Railway works, had moved out and was boarding with a family nearby in Pear Tree Street. The second son Charles Hallam had also left home by then, but had moved significantly further afield. He too had entered the building trade, but had travelled to the United States in late 1890 and was successful in finding employment as a carpenter at the Pullman Car Company railway carriage works in Chicago (Illinois). In my collection of family papers is an envelope addressed to Hallam in Chicago, stamped and franked at Normanton and Derby Post Offices with the date 12 January 1891. Inside the envelope are letters to Hallam from his father and from his three sisters Maggie, Lily and Helen. In his letter, Henry thanks Hallam for his recent letter accompanied by a "book of Pulman," a large format bound collection of mounted prints depicting Pullman's developments in southern suburbs of Chicago, which has fortunately survived in the family archives. He describes the effects of the severe winter on employment in Derby and relates a couple of anecdotes which provides some insight into the family's day-to-day life in Derby. The letters from Hallam's sisters are charming, although pretty much what you would expect from a fourteen, eight and seven year-old, respectively, with those of the two younger characterised by rounded, shaky handwriting and a few spelling mistakes. I wish you manny [sic] happy returns of your Birthday, all of us do if they had not time to say so in their letters. We are going to have a little entertainment. We have all sent a few cards to you. I send you my Photo. Ma says when you have half an hour to spare pop across & put hinge on Table door. It wont take long. We often look at the time & think what time it is with you. The snow is coming down fast. Ma & Pa went to our entertainment last Friday & left Frank to serve beer, just fancy. I played a duet. With love from Maggie. How exciting to find in there the reference, "I send you my Photo." Could she be referring to the photograph of her featured above, now in my aunt's collection? I think it very likely. Hallam was, according to my father, an inveterate hoarder and almost certainly would have brought back to England such letters and photographs when he returned home in November 1892. My grandfather inherited all of Uncle Hallam's family photos when he died in 1960, and they were subsequently passed on to my aunt a decade and a half later. Even if this is not the exact portrait, I think we can safely say that this is more or less how she would have looked at the time she wrote the letter. I don't have any portraits of Charles Hallam Payne that I can categorically state were taken during his brief stay in Chicago, from late 1890 until November 1892, but I believe this tintype to be a very likely candidate. Unfortunately it is slightly out of focus, roughly trimmed, has experienced some darkening and loss of contrast, and the lacquer used to coat the image now has a honeycomb of fine cracks, but it still gives a good impression of Hallam as a young man. As referred to in Maggie's latter, Hallam turned twenty on Boxing Day 1890, and he looks to be about that age in this photograph. In the last decade of the nineteenth century tintypes of this size were far more commonly used in the United States than in England. In fact, of only two other tintypes of similar vintage in our family collection, one is of my grandfather Charles Leslie Lionel Payne in a baby carriage, which I am fairly certain was taken in late 1892, also in Chicago. While this investigation is by no means complete - I expect to continue finding more snippets relating to Lucy Mary's childhood in the years to come - I am starting to build a mental picture, not only of her but of the family and their life at that time. I can envisage Henrietta getting the four youngest children ready for school each day, and them heading off on the journey which would only have taken them a couple of minutes, as the school was situated diagonally opposite their house, and the gates were just a few yards up Hastings Street. I can imagine the enormous amount of fun that she and her brothers would have had playing in the snow after school had finished for the day, making tracks to slide on when it all turned to ice, not to mention the pile of dripping and muddy clothes that Henrietta would have had to deal with when they got home. I can easily see her sitting down reluctantly with her two younger sisters, each clutching identical single pieces of notepaper, two days before Christmas, after having been nagged by their mother. Then I imagine them wondering aloud what they could write that might be of the remotest interest to their older brother, who had set off a few months earlier on an exciting adventure across the seas. They were perhaps sitting at the same kitchen table in the St James' Road house where, a few minutes earlier, Henrietta had distractedly served an extra plate of food for an her absent son, which was then wolfed down eagerly by an ever hungry eleven year-old boy. Since my own pre-teenage daughter is learning to play the piano and also performs at concerts two or three times a year, the entertainment referred to by Maggie is another facet of their lives that I have no difficulty in bringing to mind. To me, the photograph is what brings it all to life, and the family photo collection therefore is the most important part of the material heritage I have received and which I will pass on to the next family historian in due course. It's now over two months since I last wrote an article for this blog, and I must apologise to my regular readers for my extended absence. Apart from the usual "end-of-school-term"/Christmas/New Year duties and shenanigans, a house guest for a couple of weeks in late December and early January, and an extended camping holiday with my family on the East Coast, I have been occupied with some long overdue updates to my other photohistorical web site, devoted to Derbyshire Photographic Studios. In searching for sources of inspiration for Photo-Sleuth, I've been looking at a collection of images of my own family, and will draw largely on these over the next few weeks. Please continue sending me interesting images that you might like to share or about which you may have questions. As those who have been following this blog for some time will realise, I'm easily distractible. Notwithstanding my return to full-time university study this year, I'll do my best to keep a regular flow of material coming. As always, I value corrections, comments, constructive criticisms, additional information, etc, so don't be shy to post in the appropriate place.